News of the enhanced 2,000 user limit was posted to Apple's Developer site and represents a doubling of the number of available testing spots from the most recent 1,000 user cap, itself announced a little over one year ago. In addition to raising the number of active testers, Apple doubled beta periods to 60 days, giving members ample time to work out kinks before their invitation expires. Developers encountered difficulties with the previous trial period limitation, saying 30 days is sometimes not a sufficient window for full app evaluations. TestFlight was updated last month to accommodate apps built for the new tvOS platform for Apple TV, which boasts a full App Store identical to those offered on iOS and Mac. Apple made the TestFlight app for tvOS available for public consumption when Apple TV launched in October. 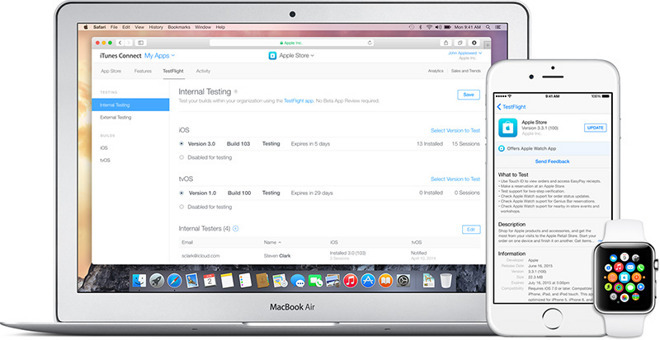 Apple most recently upgraded TestFlight in August with a number of new features, including app thinning, support for WatchOS 2 and the ability for developers to seed software builds to users outside of their dev teams.